Shannon Cohen and Patricia Sosa VerDuin presented "Invisible Walls, Ceilings and Floors" on March 2 and 16, 2017 detailing thier research about the experiences of women of color in leadership. Shannon Cohen and Patricia Sosa VerDuin began having conversations about the representation of women of color in leadership in the news while they got to know each other as W.K. Kellogg Foundation Community Leadership Network Fellows. Cohen is the founder and principle of Shannon Cohen, Inc. and Sosa VerDuin is the principal of Mobius Coaching. Their frustrations with the lack of representation and misrepresentation of female leaders of color in West Michigan in the media led them to from the project 'Invisible Walls,' a survey focusing on both quantitative and qualitative data about the intersection of race, gender and leadership. On March 2 and March 16, 2017, Cohen and Sosa VerDuin presented their findings to the greater Grand Rapids community, many of whom were the leaders themselves who were interested in hearing the cumulative results and reconnecting with others from their survey groups. One hundred and twenty women were surveyed and 80 of those women also participated in focus groups. Cohen and Sosa VerDuin started by explaining their approach, noting there's a lot of qualitative data out there, but not a lot of deeper, quantitative data that digs into the stories and lived experiences of leaders who are women of color. “Stories are important. Stories are interculturally competent. Perspectives inform what we see and we need a story for that," Cohen said. Cohen and Sosa VerDuin asked the women about the challenges they faced in the workplace. "What we found is that women were doing the work without the title. Where they would have the title of administrative assistant, but when they would outline the work that they were doing, they were directors. We found that women of color don’t always have the title to go with the work that they do and the output they generate,” Cohen said. Another big issue discussed was the perceived weakness of their identities by the majority white culture versus the strength of their identity. “Not being able to bring the fullness of my identity to the workplace was a barrier. For many of the women we talked to, culture and heritage and ancestry informed and shaped their competitive advantage as leaders. And so not being able to bring that into the workplace was problematic. 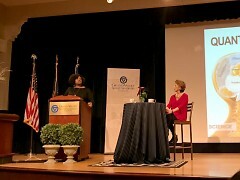 Because often for women of color in leadership these qualities that we talk in leadership like resilience, tenacity, the ability to bounce back from adversity, non-traditional and innovative thinking, navigating resource scarcity-these are not just things we learned in the workplace, these are things we bring from our ancestors and our heritage and our identity," Cohen said. 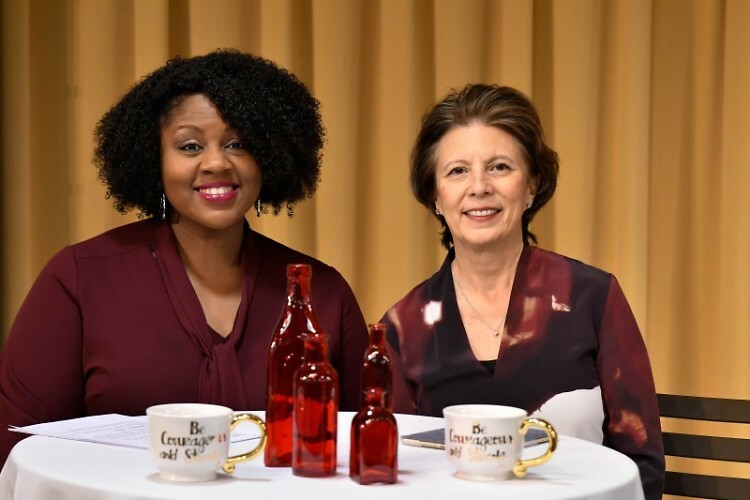 Cohen and Sosa VerDuin also discussed the pressures faced by a women of color who is the first and only woman of color in her workplace or at her position. 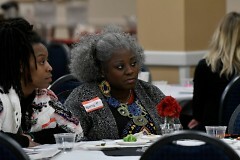 One attendee spoke to the frustration of not only being expected to be an expert in her field of project management, but also an expert in all Black culture and people as well. Special attention was given to how draining and heavy this experience can be for leaders who are women of color and how important self-care and affinity groups were to maintaining energy and health. Sosa VerDuin and Cohen also spent time talking about how to be a better ally when they were working through the challenges for female leaders of color and needed action steps. “Through the study we heard women say 'West Michigan Nice' becomes almost an avoidance. How that shows up in the workplace, especially if we’re talking about the intersection of race, gender and leadership is that is shows up in good intentions mean enough. Good intentions supersede impact. One of the things we like to say is just because I didn’t mean to hit someone with my car, if I hit someone with my car I need to own the intention and impact. Sometimes these conversations stop with “we meant well” and it doesn’t help us go further to the impact to the people that are on the receiving end of even our good intentions," Cohen said. The importance of women of color in leadership finding local affinity groups was also highlighted as a place where women of color can take pride in the accomplishments of each other and also have space to speak the truth of their experiences in an authentic way. Local affinity groups such as the Latina Network of West Michigan and Black Women Connect GR were also mentioned as ways for women to gain access to broader pipelines for networking and mentoring. Women were the overwhelming majority at both events and were very receptive to what Cohen and Sosa VerDuin had to say, often murmuring in agreement or giving applause. Many spoke of feeling validated by the findings and feeling encouraged by being around others with similar experiences. To download the full report, visit Cohen and VerDuin’s new site, sisterswholead.com. Cohen and Sosa VerDuin said they’ve been very encouraged by the response to their work and are looking to garner more funding to put the proposed action steps from the women surveyed into practice, including a future retreat for female leaders of color, future gatherings and a directory where women of color can rate their experience in different workplaces.